Height Challenges - Family Times is an award-winning magazine with staff-written news, feature stories and artwork that inform and inspire Central New York parents and their children. Cold and snowy weather doesn’t have to mean an end to climbing adventures for the year. Central New York offers both inside and outside climbing facilities to answer the call of the wild climber—even when two feet of snow has piled up outside. 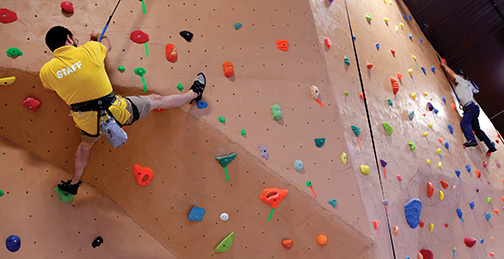 “Rock climbing is an evolving sport with an individual person learning how they can climb and learning new techniques,” says Aaron Gross, manager of The Ledge, a climbing center located in the new Pacific Health Club in Liverpool. Uninitiated parents may think climbing is just about scampering over rocks or trying to reach the top of a wall. And much of it is. But it’s also a sport that can last one’s whole life “working every part of your body, including your mind,” Gross says. The Ledge’s wall is 27 feet tall at its highest point. In Oswego, The Wall—designed for bouldering, which means no safety harness—reaches 14 feet tall. And in LaFayette, the outside wall at Adams Eden Camp stretches roughly 40 feet. Climbing facilities offer options for beginners, intermediate and advanced climbers of all ages. Essentially the hand and footholds are bigger and located nearer each other for novice climbers. The degree of difficulty increases as the holds become smaller and are placed farther apart, requiring more dexterity and planning by the climber. 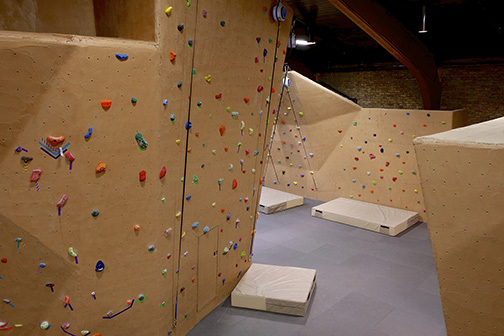 The Ledge offers a shorter wall for inexperienced children to try climbing; the minimum recommended age is 8. But it also has a wall for bigger beginners to try. This wall slants forward, making it easier to stay on, and the larger holds are placed more closely together, creating almost a ladder or staircase path to the top. With practice, climbers start to follow color-coded paths to the top, and this is where the challenge comes in. “The younger the child starts rock climbing, the earlier they can figure out what their body can do and how it works,” says Gross, who started climbing at 17 in his gym class after wrestling season ended. While upper-body strength is important, so is lower body strength and flexibility. Part of the challenge is determining how to get one’s body to the top, and that differs for each climber. Climbers at The Ledge use auto-belays: safety ropes attached to each climber’s harness, controlled by the climber. Twelve-inch crash pads on a one-inch foam mat that runs through the whole area provide a cushion for falling. The Ledge also has a bouldering wall, about 30 feet long. In bouldering, the climber does not wear a safety harness and climbs with just climbing shoes and chalk to dry sweaty hands. The Wall, on West First Street in Oswego, is devoted to bouldering only. “The main goal of this place is to have this place in the community,” says owner Mike Taber. The multisided wall is surrounded by 14-inch crash mats for safe drops. Rolled ankles are the most common injury, according to Taber. When people get up high, self-preservation seems to kick in and they become more safety conscious, he notes. The starting age at The Wall is also 8 and parents can provide positive reinforcement by trying it, too, Taber says. Individual and group lessons are available, along with shoe and chalk rentals. “The main benefit of climbing for kids is that it never goes away,” says Taber. “I played lacrosse in high school, but the teams go away once you get out of college. But climbing you can do for life (and it’s) not weather-dependent.” The indoor facilities are training grounds for climbing the mountains in the Adirondacks and other locations around Central New York, he adds. Climbers can compete as well from the local level to international. Many children in Central New York may get their first taste of climbing on the traverse wall at the Museum of Science and Technology (MOST) in Armory Square in Syracuse. Some schools have turned one gymnasium wall into a climbing wall and some fitness centers, like the Jewish Community Center in DeWitt, provide a climbing wall for members. In addition, those looking for a high-level thrill can try the ropes course at WonderWorks at Destiny USA. 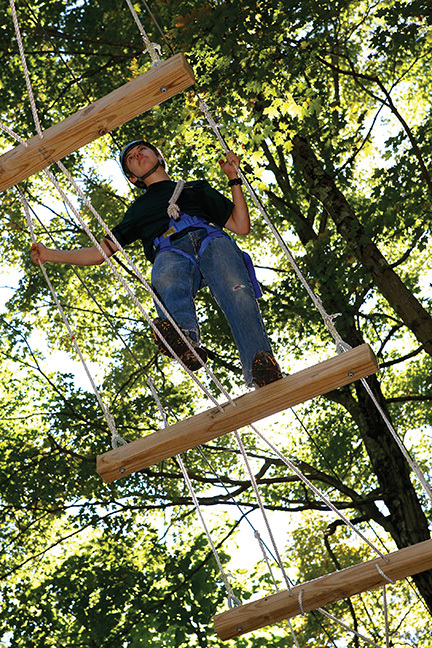 Families, schools, church groups and clubs seeking group challenges can venture onto ropes, ziplines and a climbing wall (in warm weather) at Adams Eden Camp in LaFayette. WonderWorks, which opened about a year ago, offers a ropes course for small children and what it bills as the “world’s largest indoor suspended ropes course” for adventurers age 4 and up. Wearing a harness, which is attached by rope to a safety wire, participants walk and climb through three levels up to 70 feet high. The course offers entertainment for mall visitors, too, who can watch ropes course participants from lower levels. 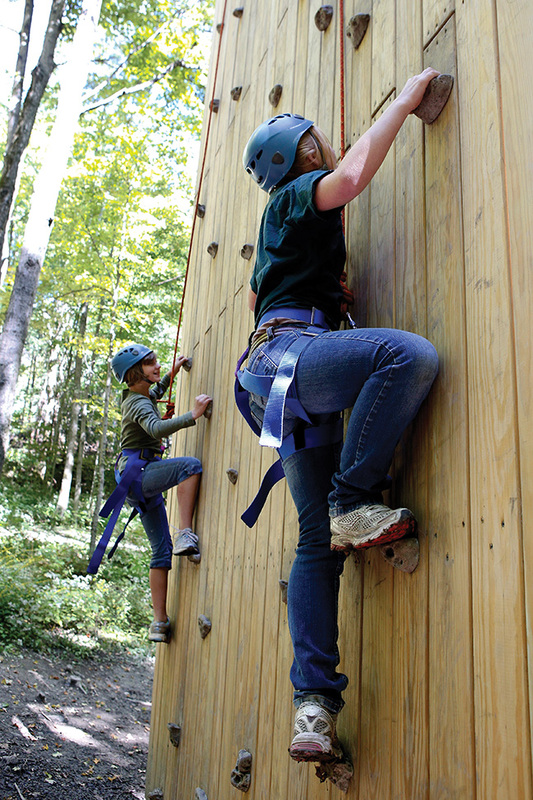 At Adams Eden visitors in groups can try a zipline and a climbing wall, which intersect with one of two ropes courses. Participants can practice in “ground school”: It mimics the higher ropes courses but is only about two feet high. When participants reach the end of the zipline at the top of the 40-foot climbing wall, they rappel down the back of the wall. Linda Adams helps manage the family-owned camp. She recommends that climbers, who use a harness and Australian belay on the wall, start at age 12, although 5-year-olds can do the zipline and there’s even a smaller “flying squirrel” for 3-year-olds. Adams Eden offers other outdoor attractions as well, for the whole family—including dogs. Hilly trails feature two waterfalls and an overlook point that offers views of Tully and Pompey. Hayrides are also available to groups, who can ride to the overlook where they can try to find their way out of the 10-acre maze, which features 30 check-in points that can be part of a GPS search as well. The climbing wall is usually closed during winter because climbers’ hands get too cold to grab the holds well enough, Adams notes. But everything else is available, even a cabin and a lodge for overnight groups of guests and snowshoes for rent in the winter. Adams Eden specializes in team-building experiences for clubs, Scouts, churches and businesses. “You will be amazed who will rise up to be a leader or who has the best strategies” on the ropes or obstacle courses, Adams says. Just looking for fun? All of these climbing locations host birthday parties for children—and even their adventurous parents. 604 Old Liverpool Road, Liverpool. 396-0455. Student day pass (ages 8-17): $12. Adult day pass: $15. Multiple-visit and monthly passes available. 77 W. First St., Oswego. 343-9255. www.topthewall.com. Day youth pass (under 18): $7. Day adult pass: $9. Shoe rental: $2-$3. (Climbing shoes must be worn to climb.) Always check the website before heading in to make sure the wall is available and to get answers to frequently asked questions. 4812 Cook Road, LaFayette. 677-5121. www.AdamsEdenCamp.com. Hiking day pass (includes trails, boating and maze): $4, individual, $8, family. Gravity zipline rides, for a minimum of three people, cost $20 each. The zipline group rate for one hour (maximum of 10 people) is $120. See the website or call for additional climbing wall and zipline rates, which vary based on group size, time spent, etc. Destiny USA, Syracuse. 466-7700. http://www.wonderworksonline.com/destiny/. SkyTykes for children under 48 inches tall: $7.99. Canyon Climb Adventure for age 4 and up: $14.99. Eileen Gilligan, an award-winning writer and mother of two, lives in Baldwinsville.